Many may not be familiar with the concept of the food co-op. The 1960s and early 1970s saw a boom of popularity in the idea. 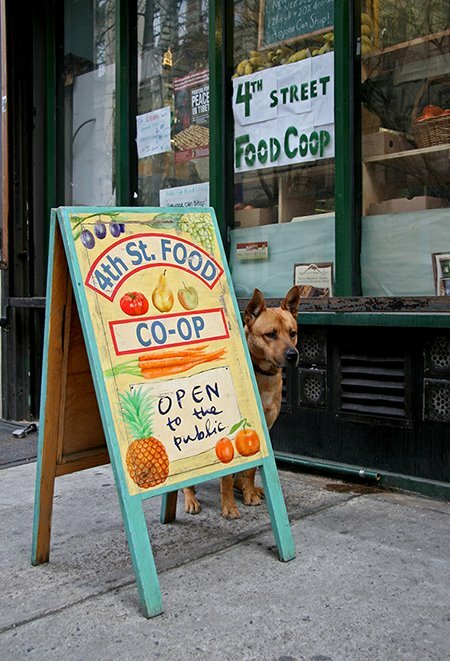 The 4th Street Food Co-op at 58 E.4th Street in the East Village, is the last surviving in Manhattan and one of only two in NYC (the other is well known in Brooklyn). The original concept is one of a cooperatively owned food store. I was surprised to learn that food co-ops go back to 19th century England and the cooperative principles set by the Rochdale Society of Equitable Pioneers in Rochdale, England, in 1844. The 4th Street Food Co-op is structured to allow for working and non-working members to get products at a discount - typically non-members can shop at a higher price. The motive is to be essentially a not-for-profit corporation. I see two problems with the food co-op for this generation. First, the food co-op is run by members and members are ideally to work there - most individuals these days have too many interests and other priorities to invest time in this manner for a small discount on food. People want convenience not more work and obligation. Non-working memberships are a way of dealing with this.